Many of you know that my once weekly blog has turned into something that I try to fit in between the responsibilities of life which have been dominating my personal landscape as of recent. One of the more pressing of these responsibilities is my pursuit of a Graduate Degree in Natural Resources. How does this have anything to do with lightweight and ultralight backpacking? Well, many of the topics I learn about I find have parallels to backpacking. After some consideration, I've decided I would mention some of the more relevant topics within the confines of my little blog for the simple fact that I think my readers would be interested. My intent isn't to imply I'm on expert on any topic, but merely to provide some of what I learned in areas where I perceive there to be some widespread misconception. I have no foresight as to what topics will be addressed or how frequently they will be posted, so for the most part my blog will continue to be dedicated more directly to lightweight and ultralight backpacking gear and trip reports. With that, for my first topic under the Education category, I thought I'd address wilderness fire. To use the correct terminology, the term "wilderness fire" or even "forest fire" is obsolete. The correct term is "wildland fire". For the most part, I think the perception of the general public towards wildland fire is that any fire in our precious forest environment is a bad thing. We've all seen various television programs peppered with images of firefighters working valiantly to keep our forests as they appear today. Preventing fires and suppressing those that do flare up has been policy in America for over 100 years. Unfortunately, there are several problems with this policy. First, nature NEEDS fires. It stirs nutrients, fosters new growth, keeps overgrowth in check, provides for habitat, and many animals and plant species have actually evolved to the point where they too NEED fire to survive and thrive. Fire actually allows trees to grow bigger because forests aren't so dense that they compete against one another. It also allows forest landscapes to be more spaced out, meaning trees aren't packed together and look more "park-like" instead of the highly dense forests we see now. Ask yourself whether you'd rather be able to walk through a forest without bumping into tree after tree and whether whether you'd like to avoid having endless bugs on your feet from overgrown vegetation and you might very well find yourself supporting fire. If you think about it, we've been told for a very long time that fire is bad. We all agree that fire in our homes, workplace, vehicles, or in places that could otherwise hurt humans, property, or things of value are bad, but we've also been told that fire in our wilderness areas are bad. Think back to the movie Bambi where forest fire was a major part of the storyline which scared the crap out of anyone who watched Bambi's and Bambi's family cope with what was implied to be a highly destructive and damaging fire capable only of killing and ruining. Think of Smokey Bear's message and the stress he put on preventing any kind of forest fire. TV, news, radio, and printed media thrive on telling stories of heroic firefighters and influence public opinion by showing pictures of dilapidated forests impacted by fire. In the end, most of us would easily support efforts to stop fire. After all, we don't want our pristine wilderness ruined. Here are some thoughts worth pondering. First, firefighting efforts are largely useless. 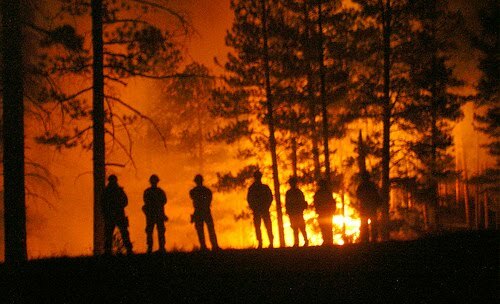 In fact, most wildland firefighters would be the first to tell you that their efforts are more for public display to show that the government is doing something against the perception that fire is evil. Firefighters also help support the firefighting budget which many would argue is a cyclical system representing American government where money is spent on fire policy that is largely ineffective to put people to work (firefighters, manufacturers of firefighting equipments, bureaucrats to write policy, scientists who investigate and make recommendations, etc.). Essentially, fire and firefighting justifies their existence. Believe it or not, the WEATHER plays a far more significant role than anything else. Out west, you'll notice that most fires only eventually end when seasonal changes bring rain or snow despite the efforts of firefighting. Many would also argue that firefighting creates many more problems than it tries to solve. First, it puts lives at risk. Second, fire lines, trenches, thinning, etc. all could be damaging to a forest ecosystem and may contribute to erosion. Fire retardants could hurt plant and animal life. Roads needed to get to fires could lead to erosion and allow poachers access to an area which was otherwise secluded. Logging operations have also convinced much of the American public that they help to reduce fuels by removing trees. Fuels, and the accumulation of them, do indeed contribute to fire. However, commercial logging operations have a tendency to remove trees of value and not the smaller trees or vegetation that actually needs to be removed to make a significant impact to fire prevention. Much like roads leading to a fire, logging roads can also allow access to an area by poachers. Logging equipment can bring with it seeds and insects from other areas which may have a devistating impact to the new environment. Logging also takes away tree canopy which allows the woody debris left behind to dry out causing an increase to fire risk. There is also something to be said about the argument that reducing fuels makes little difference because the weather (specifically drought and wind) play a far greater role. Using Alaska as an example, they have a substantial built up of fuels but have little fire because of the differences in weather. If the assumption is that logging is bad, many people want to know why logging usually isn't permitted in an area that is destine to be set on fire (human-caused) anyway because valuable timber would be turned into ashes for seemingly no good reason. The answer is because the removal of what is likely valuable commercial trees actually feeds the soil for up to 100 years if allowed to burn and contributes to the local ecology. If it is removed, the nutrients go with it. So am I implying that we should allow places like Yellowstone to burn if ignited by a careless camper or lightning strike. Well, yes. I realize this isn't a popular answer because we all like seeing the scenery, but the bottom line is that the ecology needs it. If we want future generations to see our wonderful world, fire cycles need to be allowed much in the same manner as they existed as part of nature before human intervention. How important is this? Very. For those of you who have visited the Great Sequoias, you'll note that there are many huge trees and virtually nothing else. This is because of our century long fight against fire, we stopped the very thing that allowed them to reproduce. Logpole pines work the same way and require fire to open their cones to distribute their seeds. Many root systems also require fire to allow them to grow and spread. Fire also provides bountiful nutrients to water systems for many generations which helps feeds fish and other acquatic life. To me, it is all quite literally that simple. We as a society need to recognize that we must shift our focus from preventing fire and suppressing it to allowing it. This requires a HUGE shift in public understanding and education. Instead of spending tons of money on firefighting efforts, this money should instead be focused towards the very things that should be protected - human life. Essentially, for homes near fire-prone areas, money should be spent on building them to be impacted in a fire as little as possible. This would include using building materials and landscaping efforts around homes and communities. Did you know that wildland fires usually aren't responsible for lighting homes on fire despite what you see in the news. Actually, fire jumps from treetops to treetops. Being that few homes have trees right on top of them, the fire instead spreads on landscaping likely installed by the homeowner who actually make their home more susceptable to fire. I'll also mention a personal belief that I think homeowners who willingly live in fire-prone areas should be required to pay for insurance to protect them so people like you and I aren't left footing the bill. But what about all the smoke if we allow these fires to burn? Well, they WILL have an impact to global warming, at least initialy, but as new vegetation grows, the end result will actually reduce global warming.